One Book 4 Colorado (OB4CO) began in 2012 as a statewide initiative to distribute free copies of the same book to every 4-year-old in Colorado. In 2016, the book chosen was Giraffes Can’t Dance by Giles Andreae, which was distributed in both English and Spanish. More than 75,000 books were given away at more than 500 sites, including Denver Preschool Program preschools and both military and public libraries. LRS surveyed caregivers and participating agencies to learn more about the impact of this year’s OB4CO program on Colorado’s children. The results are compiled in our newest Fast Facts report. After receiving Giraffes Can’t Dance, nearly three-quarters (72%) of caregivers who responded to a survey agreed that their child was more interested in books and reading, and more than two-thirds (68%) said that their child talked more about books and reading. Caregivers who reported reading to their child less than once a day were more likely to agree that the OB4CO book helped their child become more interested in books and reading. After participating in OB4CO, 4 in 5 (80%) caregivers felt that their community promoted a culture of reading. The participating agencies surveyed also felt that the program had a positive impact. Nearly all agencies who responded to the survey (98%) reported that the 4 year-olds were excited to receive their copies of Giraffes Can’t Dance, and 9 in 10 (89%) said that the children talked about their book with others. Agencies also noticed an impact on the children’s parents; 7 in 10 (70%) of the participating agencies felt that parents showed an increased awareness of the importance of childhood reading and over half (54%) said that the OB4CO program brought new families to the library. Voting for next year’s OB4CO will open in early January. Be on the lookout for the 2017 book options and vote for your favorite! More information about the OB4CO program can be found here. 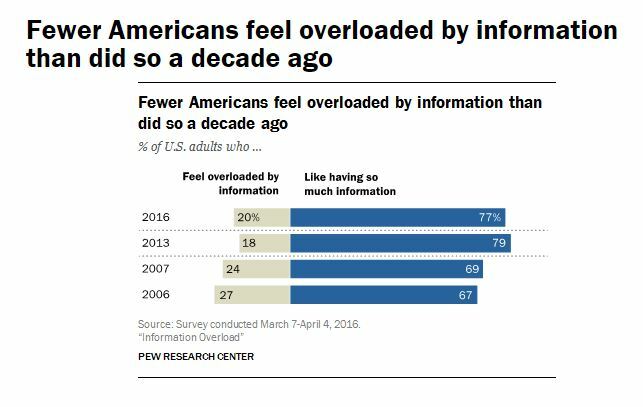 Over three-quarters (77%) of respondents like having so much information easily available to them, compared to the 1 in 5 (20%) who feel overwhelmed by information (down from 27% who reported feeling overwhelmed in 2006). Two-thirds (67%) of respondents were happy about having more information at their disposal, saying that it helps to simplify their lives. In general, respondents that were considered to be “gadget rich” (having a combination of broadband home internet, a smartphone, and a tablet computer to access information) were less overwhelmed by the amount of information present. More than 4 in 5 (84%) “gadget-rich” respondents like having so much information available, while only just over half of “gadget-poor” respondents said the same. “Gadget-poor” respondents were also more likely to say that the amount of information available makes their lives more complex, that they have difficulty finding the information they need, and are not confident using the internet as an informational tool. There is no sign that the flow of information will slow down anytime soon. Librarians have an opportunity to help their patrons feel comfortable interacting with information, using information tools, and identifying false information online. As the survey results indicate, providing patrons with access to more information gadgets can be helpful for those who may not be able to afford them, as can teaching information literacy classes to increase their patrons’ ability to find the information they need. A recent survey by the Maine State Library shows that librarians are the second most trusted professionals out of the 22 professions studied. The purpose of this research was to determine the perceived trustworthiness of librarians compared to other professions and to assess perceptions of librarians across demographic groups. When asked about their perceptions of trustworthiness, more than three-quarters of respondents (78%) rated librarians as “very high” or “high.” The only profession viewed as more trustworthy is nursing; 4 in 5 respondents (81%) rated nurses as highly trustworthy. Five other professions received either “very high” or “high” ratings from at least half of the respondents. These include pharmacists (74%), medical doctors (68%), high school teachers (59%), police officers (59%), and clergy (54%). The least trusted positions include stockbrokers (9%), lobbyists (4%), advertisers (3%), members of Congress (3%), car salespeople (2%), and telemarketers (2%). The survey also revealed that more highly educated respondents were more likely to give the most trusted professions a higher rating. For example, 3 in 5 respondents (60%) with a high school education or less rated librarians as trustworthy, while about 4 in 5 of those with some college (78%) or a four-year college degree or more (85%) rated librarians as trustworthy. Respondents with a yearly income between $50,000 and $100,000 were most likely to trust librarians, with more than 4 in 5 (85%) rating librarians as trustworthy. About three-quarters of respondents with an income of less than $50,000/year (73%) and above $100,000/year (75%) perceive librarians to be trustworthy. 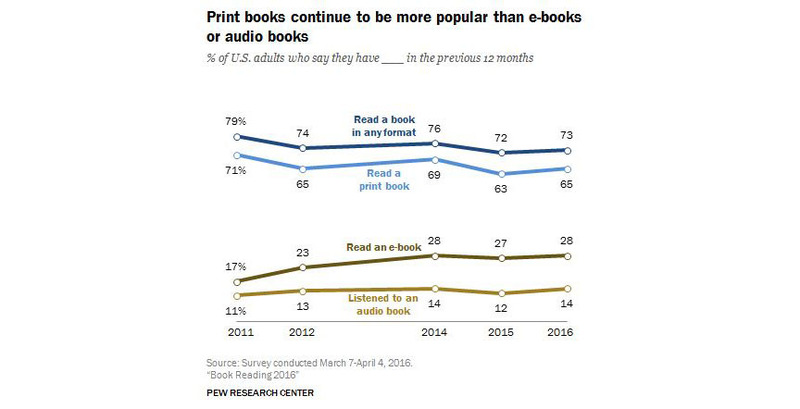 A recent Pew survey found that print books remain the most popular method of reading books, despite more options like e-books and audiobooks that are readily available. The results presented in this report came from an annual survey started in 2011 to measure book reading among American adults. In the past year nearly three-quarters (73%) of American adults report reading at least one book. Out of the people surveyed, about two-thirds (65%) have read a print book in the last year. This is more than double the number of people who reporting reading an e-book (28%), and more than four times the number that reporting listening to an audiobook (14%). The share of people using e-books and audiobooks to consume book content has also remained stable in recent years. The number of books American adults read per year, in any format, has also remained steady since 2011. In the last year, Americans read an average (mean) of 12 books per person, while the typical (median) American read 4 books. Americans reported reading books for varying reasons over the past year. More than 4 in 5 (84%) respondents said that they read to research specific topics of interest, 10% more than in 2011. A similar number (82%) read to keep up with current events, and nearly half (47%) of these respondents did so every day. Eighty percent of respondents also reported that they read for pleasure, which is exactly the same share as 2011. About 3 in 5 (57%) respondents reported that they read for work or school. For more information, you can find the full Book Reading 2016 report here. Library Journal’s annual Placements & Salaries 2016 report shows a positive view of the library job market, marked by increasing salaries and full-time employment. The data from this report is drawn from a survey of 2015 LIS graduates. According to the survey results, 2015 graduates were generally successful in finding jobs, with about 4 in 5 (82%) reporting that they were employed full-time. This is consistent with the number reported by 2014 graduates (83%), and well above full-time employment reported in 2013 (70%). Graduates of the 2015 class also tended to be younger than their predecessors; more than two-thirds were under 36 and over half were pursuing librarianship as their first career. The salaries reported also showed significant increases from previous years, with salaries rising in public, academic, school, government, private industry, and special libraries. The average starting salary across all libraries is $48,371, which is 3% higher than last year. Salary increases were especially noticeable for women graduates, whose starting salaries rose 5% to $47,759. Starting salaries for men dropped 3%, but their average starting salaries remain higher than those of women at $51,602. 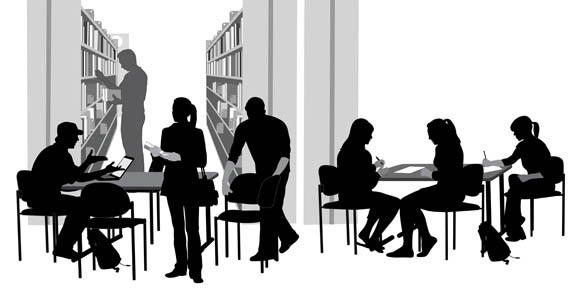 The largest salary gap between men and women is in public libraries; men only account for about 1 in 10 (12%) public librarians but report an average salary 9% higher than women report. While most LIS graduates were able to find full-time employment, it took hard work and patience to land those jobs. More than half of employed LIS graduates remained with the same employer they worked for during their time in graduate school. About a third found a job before their graduation date, but reported beginning their job search about six months before leaving school. Those who did not start their job search until after graduating said that it took nearly five months to find a job. The full report and data tables can be found on the Library Journal website. A recent study conducted by the Johns Hopkins Institute for Education Policy has shown that a much larger number of students perform above grade level than previously thought. After noticing that “getting students to grade level” was a prevalent goal throughout national education policy, the research team behind this study wanted to figure out how many students already perform one or more years above grade level on their first day of school. After examining assessment data sets from five states, the researchers found large percentages of overachievers in every state. 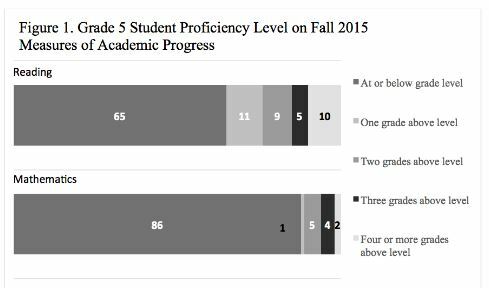 In Wisconsin, between a quarter (25%) and about a half (45%) of all students could have passed the next grade level in the spring of their current grade. For example, more than a third (38%) of Wisconsin’s third-graders already knew enough math to be able to pass fourth grade. Similar numbers were repeated throughout the states studied: between 11% and 37% of students in California could have passed the next grade level, and between 30% and 44% could have in Florida. These percentages are significant, and even more so when translated to the number of students who are currently not being challenged in class. Using Wisconsin’s data, somewhere between 278,000 and 330,000 public-school students across grades K-12 are performing more than a year above where they are placed in school. In California, that number sits between 1.4 and 2 million students. Across the U.S., more than one million fourth-grade students would have outscored the same number of eighth-graders in math, which, as the researchers note, means that in a single year the number of students already performing four years above their current grade level outnumbers the entire population of Rhode Island. 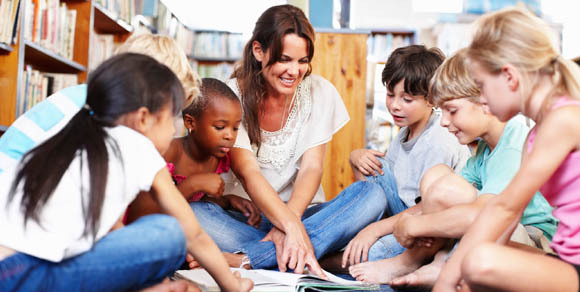 As an educational resource outside the classroom, libraries can help stimulate overachieving children in a number of ways. For example, helping children seek out information about topics of interest for independent research and providing activities for children of all ability levels can help deepen their learning outside of school. 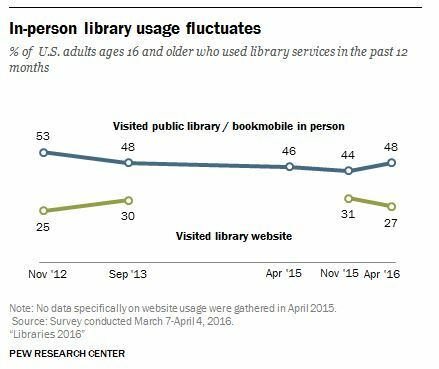 Pew Research recently released their annual report on attitudes of Americans towards their public libraries, Libraries 2016. Alongside a plethora of information detailing who is visiting public libraries and why, Pew also reported on those who are not visiting the library. Among those surveyed, 1 in 5 (19%) said that they have never visited a public library or bookmobile. The demographic analysis of this data points to groups that the library could make a more concerted effort to reach. Someone who has never visited a library is most likely to be male (a quarter of all male respondents said they had never visited a library), part of a minority group (nearly a third of both black and Hispanic respondents), and have less education (29% of those with a high school degree or less). Members of other demographic groups also reported that they had never visited a library: about 1 in 10 of both those with college degrees (11%) and those in households earning $75,000 or more (12%). Despite having never visited a library, respondents maintained a generally positive view of the libraries in their communities. More than half (56%) of non-users agree that closing the library would have a major impact on their communities, and about 1 in 5 (19%) think that it would have a major impact on their families. Nearly two-thirds (65%) of non-users thought that the library actually does provide them with the resources they need, so it is possible that they are still accessing library resources through friends and family. The results of this survey revealed that the primary difference between frequent library users and non-users has to do with the information sources they trust. Respondents who had visited the library at least once in the past year were 39% more likely than non-users to agree “a lot” that libraries are a trustworthy information resource. You can find more information about library non-visitors here, and the entire Libraries 2016 report can be found here. In the beginning of 2016, Library Journal surveyed 395 public libraries to create the Audiobooks and Public Libraries report. The findings included how often audiobooks are being circulated, the genres that are most popular to collect, and the changing format preference of audiobook patrons. In 2015, audiobook circulation amounted to a little over 1 out of 10 items circulated (13%). A majority (66%) of the audiobooks circulated were physical CDs or Playaway players, rather than digital downloads. However, nearly 9 in 10 (86%) libraries reported an increase in digital audiobook circulation, while about one-third (35%) reported an increase in physical audiobook circulation. LibraryJournal projects that by 2019, downloadable and streaming audiobooks will make up 51% of an average public library’s collection, as opposed to 38% in 2016. The audiobook collections of the libraries surveyed lean heavily towards adult fiction. Three-quarters (75%) of current audiobook collections are adult titles, while the remaining quarter (25%) is comprised of young adult and children’s titles. Across all titles, about 4 in 5 (79%) are fiction; for comparison, print book collections are typically about 60% fiction. Patron request is overwhelmingly the most important factor influencing audiobook purchases for the libraries surveyed. Others influencing factors included the popularity of the print book, positive reviews, and the audiobook’s narrator. For more information about audiobook use in public libraries, check out the full report here. Pew Research recently published the results of a survey examining internet use of Latinos and Spanish-dominant Latinos in the United States. Overall, they found that the digital divide that between Latinos and whites is at its narrowest point since 2009, declining from 16% to 5% in 2015. The share of Latino adults who report using the internet increased by 20% in the past six years, with more than 4 in 5 (84%) Latinos reporting regularly using the internet. However, less than half (46%) of Latinos who access the internet do so through a home broadband connection, a number that has only increased by 1% since 2010. This is where internet use practices of Latinos begin to diverge with those of whites, since almost three-quarters (73%) of white internet users have broadband access at home. Latino internet users are also among the most likely to use a mobile device to access the internet. Nearly all (94%) of Latino users report using mobile internet devices, a share higher than white internet users (85%). Mobile devices are especially common among younger Latinos, but nearly 3 in 5 (58%) Latinos aged 50-64 and about a third (35%) aged 65 and older report accessing the internet this way. Latino internet users are also twice as likely (23%) as whites (10%) to be “smartphone dependent,” meaning that they do not have home internet access but do use a mobile device to access the internet. Understanding internet use across different demographics can help libraries provide internet access to every member of their community. For example, knowing that many Latino and Spanish-speaking community members do not have home broadband indicates that they may be dependent on public computers or wireless internet sources, especially older Latinos who do not tend to use smartphones. Creating computer literacy programs that can accommodate Spanish-speakers could help welcome this group to the library and provide a reliable internet source. For more information about internet use among Latinos, check out the full report here. The Public Library Association (PLA) recently published the results of their Public Library Data Service Annual Survey. The survey data are from fiscal year 2014 and include finances, resources, service usage, and technology use in public libraries. One finding documented in the report is the recent tendency of libraries to hire more non-MLS staff than MLS librarians. The percentage of staff with “librarian” in their job title has steadily increased over the past ten years to make up just under a third (31%) of all library staff. The average percentage of MLS-degreed librarians employed by reporting libraries increased by 2.4% since FY 2009, while non-MLS librarians increased by 3.5%. Non-MLS librarians currently represent about 4 in 10 (39%) of all librarian staff, the highest percentage since FY2009. 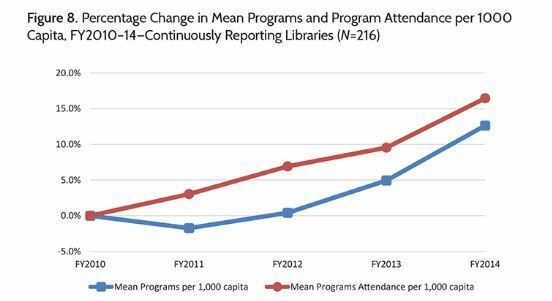 Libraries also reported steady increases in both the number of library programs offered and program attendance. Although growth has been reported for the past three years, FY2014 marked the fastest rate – programs offered by public libraries increased by 7.3%, while program attendance increased by 6.3%. As PLA notes, more library programming combined with declining circulation numbers suggests that libraries are shifting their service delivery priorities. The full report provides a wealth of information about public libraries in the United States and can be found here.